The Volga is the longest river in Europe. In Russian it is called Волга, in the Tatar language its name is İdel. Many people see it as the national river of Russia. It flows through the western part of the country. It is Europe's longest river, with a length of 3,530 kilometres, and forms the core of the largest river system in Europe. It rises in the Valdai Hills of Russia, 225m above sea level north-west of Moscow. The Kama, Oka, Vetluga and the Sura are its main tributaries. 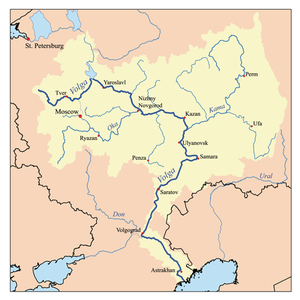 The Volga and its tributaries form the Volga river system, which drains an area of about 1.35 million square kilometres in Russia. The Volga Delta has a length of about 160 kilometres. It includes 555 channels and small streams. It is the largest estuary in Europe. It is the only place in Russia where pelicans, flamingoes, and lotuses may be found. The Volga freezes for most of its length for three months each year. Some of the biggest reservoirs in the world can be found along the river. Wikimedia Commons has media related to Volga River. ↑ "The Volga River". Rivers of Life. Center for Global Environmental Education - Hamline University Graduate School of Education. 2001. Retrieved 2008-10-24. This page was last changed on 23 October 2018, at 19:42.